It is an unassailable fortress, which has never been conquered. Built in 1593 A.D. by Raja Rai Singh, one of the most distinguished generals in the army of Emperor Akbar, the fort is a formidable structure encircled by a moat. One of the most imposing forts of Northern India-- Junagarh Fort has remained unconquered till date. This fort was built in 15th century by one of the most able and trusted generals of Akbar, Raja Rai Singh. The main entrance to the fort is Karan Pol [gate], that is east facing. Next to it is the Suraj Pol meaning the sun gate. The fort situates in it some very magnificent palaces like Anup Mahal, Ganga Niwas and Rang Mahal or palace of pleasure. The Har Mandir is the majestic chapel for the royal family for worshipping their gods and goddesses. These palaces, constructed in red sandstone and marble, make a picturesque ensemble of courtyards, balconies, kiosks and windows dotted all over the structure. The premises also houses a museum which is an array of a rich collection. A high wall and deep moats surround the fort. The 37 bastions guard the fort and only two gates provide the access inside the fort. The Suraj Pol or the Sun Gate is the main entrance to the fort. The Junagarh Fort has defied all the attacks except for the brief stint by Kamaran who captured the fort but was unable to retain his victory more than 24 hours. Inside the fort is a profusion of 37 palaces, temples and pavilions that are marvels in red sandstone construction. The palaces have exquisitely carved windows, balconies, towers and kiosks.The mirrors, paintings and carved marble panels in the Moon Palace are a treat for eyes. 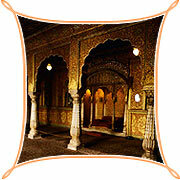 The Phool Mahal or Flower Palace was adorned with glasses and mirrors. The victory over Aurangzeb was celebrated by building the Karan Mahal.